Brilliant new self-assembly concept, cleverly, elegantly and successfully engineered, brings USA-built American rock maple Ludwig drums into the middle budget arena. Fun. Affordable. Sounds decent. It's refreshing to encounter a truly different product. Supplied tom heads are not a great match. A flat pack kit! What a great Ikea, sorry, idea (couldn't resist). Well, Ludwig's Signet is not a flat pack, but it is certainly shipped unassembled, telescoped into a single weighty box with the bare shells all drilled and ready for assembly. 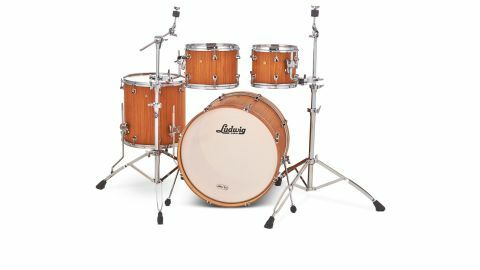 "You can now own an American-built Rock Maple Ludwig kit at a fraction of the normal cost"
The customer fits together the kit thereby saving Ludwig considerable time and effort, not to mention simplifying shipping. The savings are passed on so that you can now own an American-built Rock Maple Ludwig kit at a fraction of the normal cost. It's a bold initiative, but does it work? We have the bigger of the two Signet 105 shell packs, the TeraBeat, with 22"x16" bass drum, 10"x8" and 12"x81⁄2" mounted toms and 16"x16" floor tom. Alternatively, you can have the GigaBeat which has 20"x15" bass, 12"x81⁄2" mounted tom and 14"x14" floor. There is no snare drum option. The shells are six-ply American rock maple, 5.5mm thick, constructed in the same Monroe, North Carolina factory as Ludwig's top USA drums, and we all know they ain't cheap. Although the shells are typical, the EcoXotec (exotic) finishes are new, being eco-friendly alternatives to the usual rare wood veneers. There are three hand-applied thin lacquer treatments which augment the outer grain on top of the six plies of maple. "They are real wood finishes that give the exotic look without cutting down exotic trees. The veneers are made of sustainably grown hardwoods that are essentially shredded up and dyed, and put back together to resemble the Ebony, Teak, and even the Alpine Blue finish." Inside, the shells are natural maple, lightly sanded and sealed, while the bearing edges rise at 45° to a central peak with a slight flat at the apex. "There's a single instruction sheet, but frankly you don't need it, the process is obvious"
So how about this assembly lark? Well, there's a single instruction sheet, but frankly you don't need it, the process is obvious. The four bare shells each have a cardboard mount with all the relevant fittings. We started with the smallest tom, mounting the 12 'snap-in' Insta-Lite lugs first. We were a bit surprised to find that when you push-and-swivel them into their holes there is some play, so they are a bit floppy. But this is taken up when you mount the head and 2.3mm steel hoop and start to apply tension, as with a normal drum. The slight looseness helps self-alignment, preventing cross-threading. The Triad small tom mounting bracket has two locating holes fixed by two bolts using a drum key. A doddle. On to the other small tom and floor tom. The latter has the usual three legs which again are fixed by Triad mounting blocks, each with two bolts. Finally, the bass drum. It's the same deal with the lugs and this time there are long tension rods which slot through the lightweight claws over the wooden bass drum hoops. There are also spurs, which presented the only brief moment of head scratching, especially for someone who hasn't read the instruction sheet! Being impetuous we fixed the first one on the wrong side and had to remove it, turn it round and put it on its correct side. That took two minutes. We mention this because it illustrates just how wonderfully simple the assembly is. There are 56 lugs, three legs, two spurs and two mounting brackets, so at a leisurely pace it takes the best part of an hour to assemble and rough-tune. No doubt you could do it in half that time if you were in a hurry. The resulting kit feels sturdy, yet lightweight. The hardware is uniformly light in design and construction compared with most heavy metalwork which is normal today. Thus the bass drum spurs are even called Stiletto spurs and the claws are decidedly low-mass. The GigaBeat is a jazz-proportioned kit, while our TeraBeat is more of a rock beast, although some might worry it's insubstantial. Personally we loved the streamlining, but then this writer is not 22 years old and out playing like a maniac every night. "In reality, these are probably some of the most durable, gig-able drums you can buy. The design of each component was optimised using Finite Element Analysis (FEA) software, adding material only where needed to achieve the necessary strength at minimal mass. "Designing the parts this way lets us reduce mass mounted to the shell, which allows for greater shell resonance, and makes the drums lighter for transportation." The Signet's unique construction should have a direct effect on its sound. The button lugs are effectively 'floating' rather than screwed tightly into the shell as is the usual case. (This gives the added bonus of no screws to loosen or rattle inside the shell.) Eight lugs - rather than 10 - on a 22" bass drum hoop actually makes tuning easier, while allowing the drum to breathe more freely. Another not inconsiderable bonus is that since you have assembled it yourself you really do know the kit, and the only tool employed is your drum key. And since the shells arrive completely bare you can tap them and hear just how resonant they are, work out what their fundamental notes are, in DW 'timbre-matching' style. Although all the hardware has been designed specifically for the Signet, the Triad tom mounting bracket is a modification of Ludwig's recent Atlas mounting system which replaces the ubiquitous isolation-style suspension brackets. The mount is in two parts, a bridged bracket which is bolted to the shell and the tom arm mount which is effectively isolated from the bracket (and thus the shell) via two hardened steel pins, floating on elastomer mounts. So again resonance is aided. In practise though - and here comes the down part - we didn't find the sound that resonant to start with. Let us explain. The kit came with Ludwig's own clear Weathermaster heads and although the sound was tonally maple-rich, initially it was hard, pingy and we were struggling to get the small toms in particular to sustain as well as they should. The solution, and we're almost embarrassed to say this, lay in changing the heads for a mix of Evans G1s and coated Remo Ambassadors which improved the sustain and overall sound significantly. The WeatherMasters worked better with the bigger drums, the floor tom and particularly the bass drum. This unencumbered beast blasted forth, the thin shell reverberating with a short but wickedly dusky sustain.